May 22, 2018. 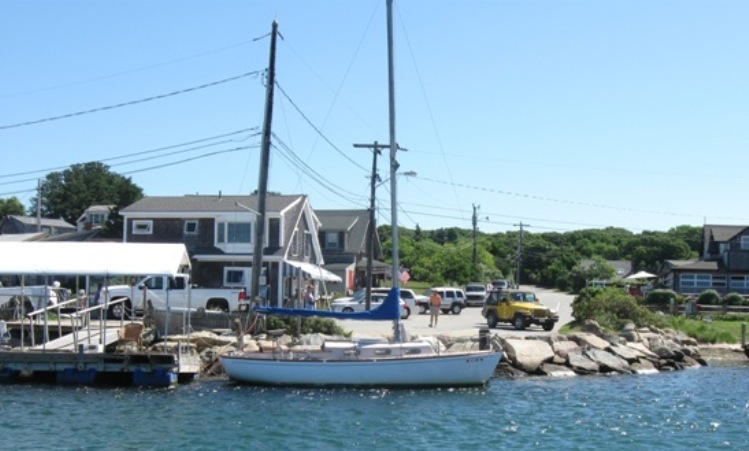 The 'Admiral' and your webmaster were on a vacation trip to Maine and, passing thru Lincolnville, stopped to have lunch with Paper Moon's new guardian, Kristie Scott. She's doing well and organizing Fred's 'stuff'. 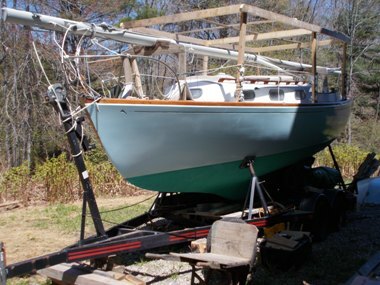 She is planning to sell Paper Moon and is getting together pictures and ad information. We took a couple of pictures of Paper Moon outside 'the barn'. 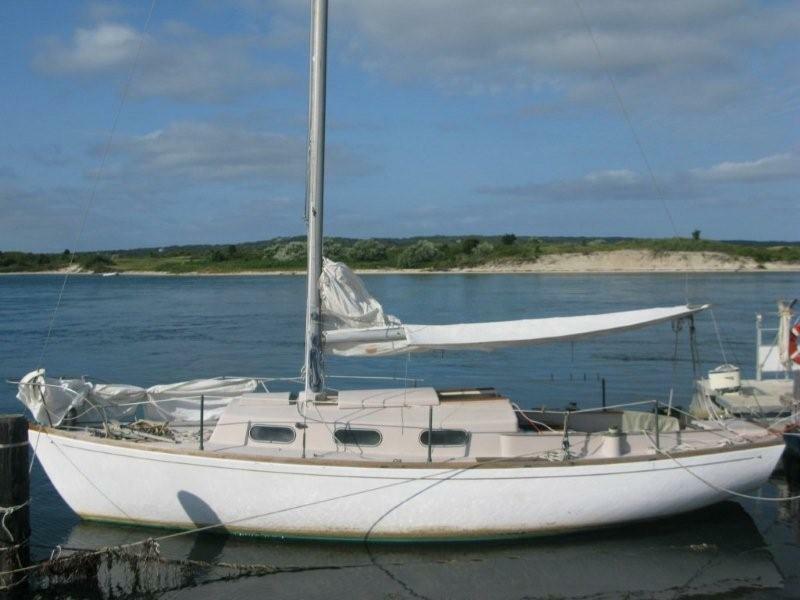 That wood structure on her deck is to support her protective tent. Click on the photos for a larger image. August 3, 2018. Still working on a more detailed ad. Kristi would like $7000 but will consider reasonable offers. 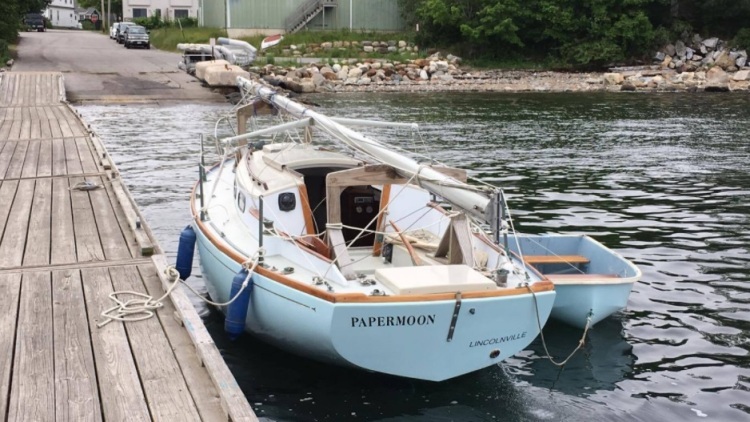 Paper Moon has a trailer and a nearly new Yanmar Diesel. Kristi's contact info is below followed by a couple of pictures. 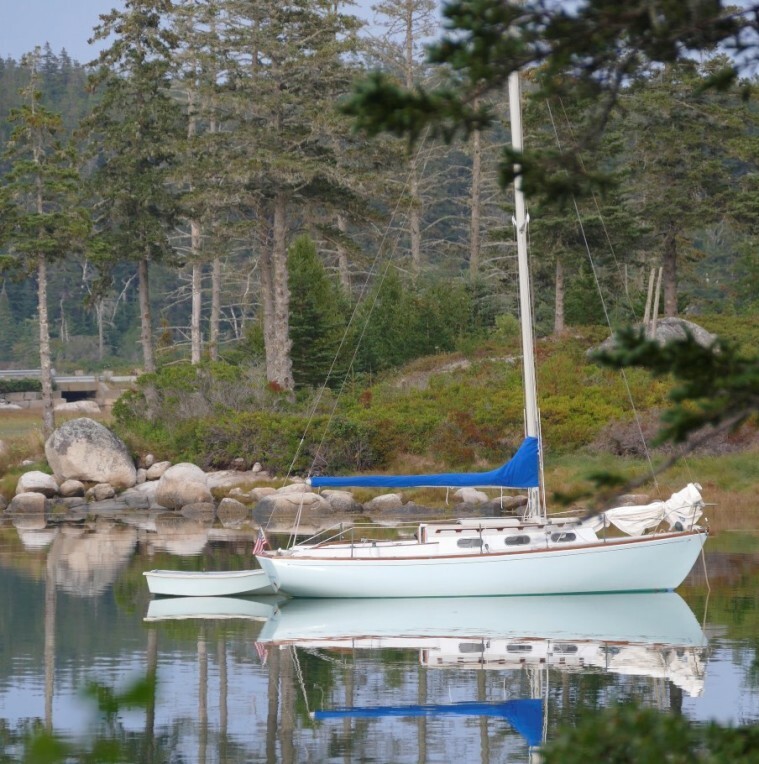 Did you get out on the water this fall? (YES - but not enough!) 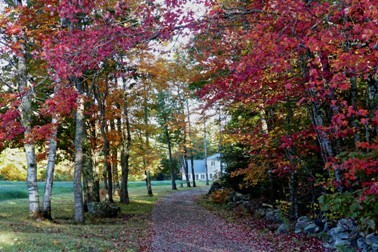 The fall color along the coast is lovely this year. 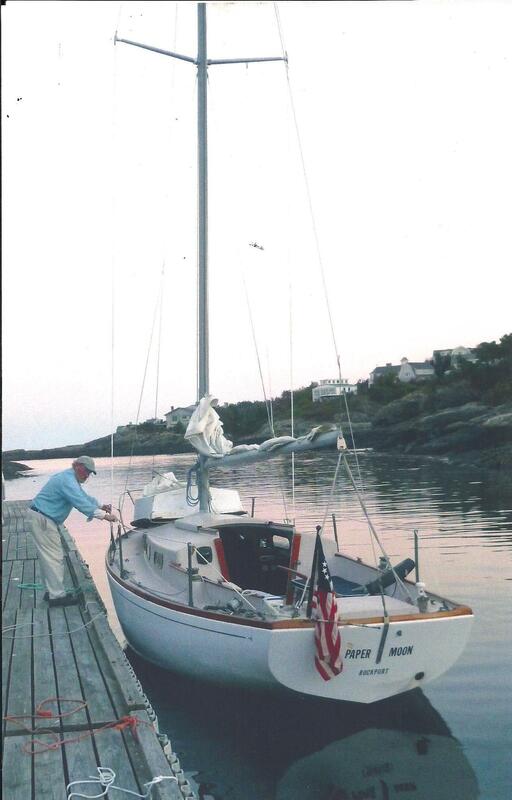 I was able to sail with family a few weeks ago - missing Fred terribly. 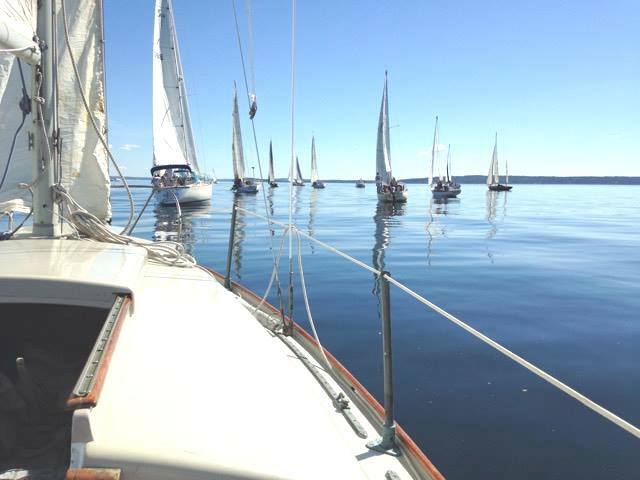 We loved sailing in the fall. I spent a few days cleaning up Paper Moon, even put a coat of varnish in the galley. My best to you and Chris. March 1, 2018. 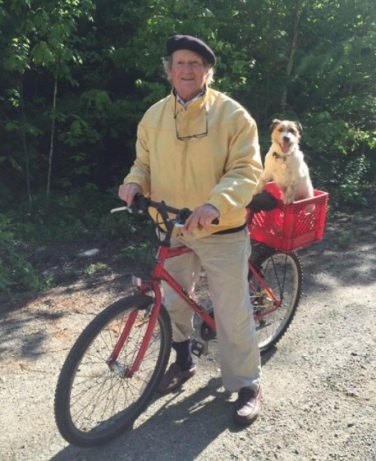 Sad news - Fred, who has been battling prostate cancer, posted his last message on Facebook. 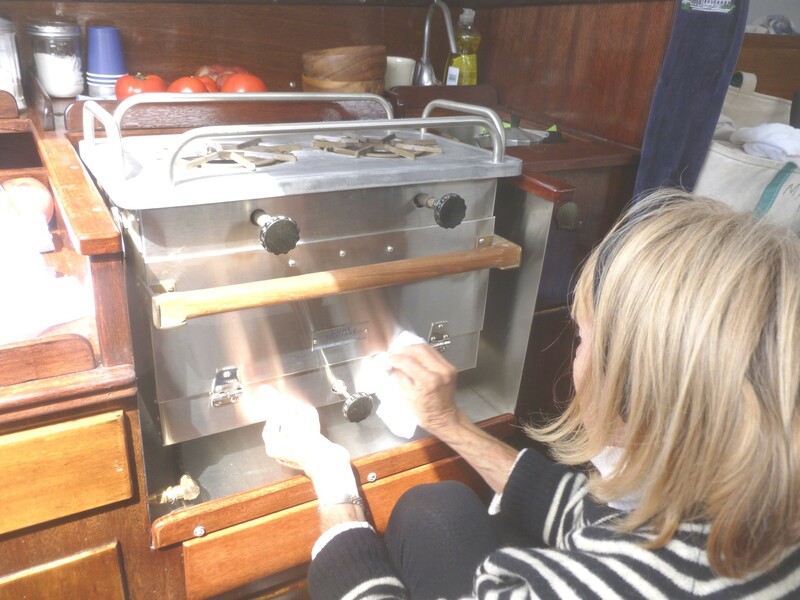 May 16, 2017 We got a note from Kristie that there will be a gathering of Fred's Martha's Vineyard friends on May 27 at the Gannon and Benjamin Boatyard in Vineyard Haven. 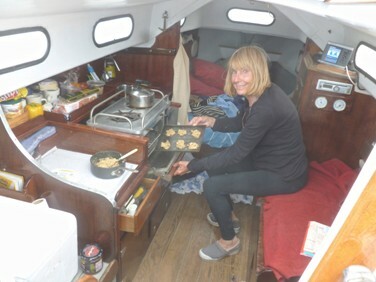 She also sent in a couple of Fred keeper photos. We put them up on Fred's service page - click here to go there. 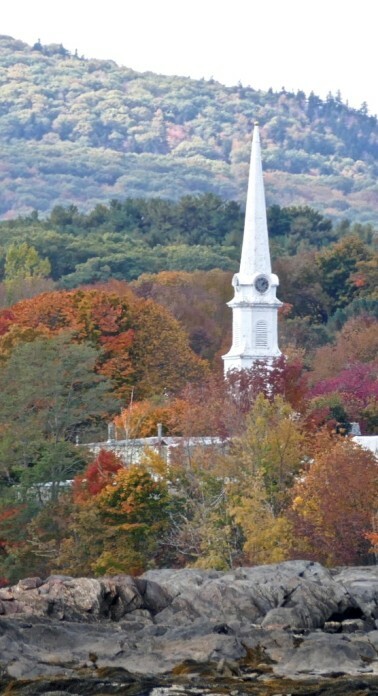 September 2, 2014. Things move fast in this Internet age. Stay with your webmaster on the set up. 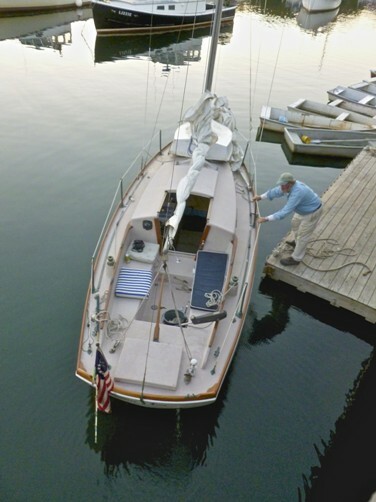 Yesterday, Mike Horn (Avellar, Yankee #73) reported seeing a Dolphin 24 on a mooring in Lincolnville, Maine. Her name was Paper Moon. 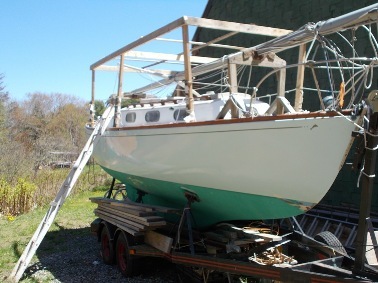 We thought this might be a newly found Dolphin, and as I was going up to Maine later this week to get Marionette, and expected to drive right thru Lincolnville, maybe I could check her out? 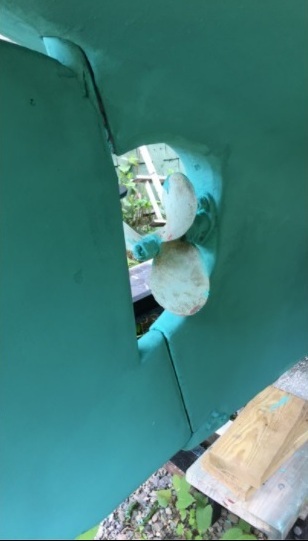 Then, today, I saw a 3rd party post relating to Fred Croft on Facebook that appeared on my page because Fred is a 'friend' and we used Facebook's messaging system to stay in touch during Fred's trip down the intercoastal on Flipper nearly 5 years ago. That 3rd party post mentioned Fred was seen on Paper Moon out on Penobscot Bay! I had not heard from Fred in a while - so I sent him a Facebook message to check out his possible name change for Flipper and heard right back from him. 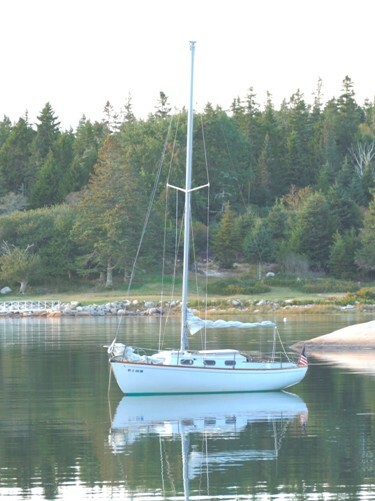 He has changed Flipper's name to Paper Moon, and has moved her from Menemsha on Martha's Vineyard back to his old cruising grounds on Penobscot Bay. I'm sure Paper Moon has her own story to tell and we'll tell it here on her own page in due time - but she has a very interesting past. Click here to read about Flipper. As we did not have any pictures yet of Paper Moon we used a Flipper photo to get us started. Here is Mike Horn's email(s) - consolidated and edited. 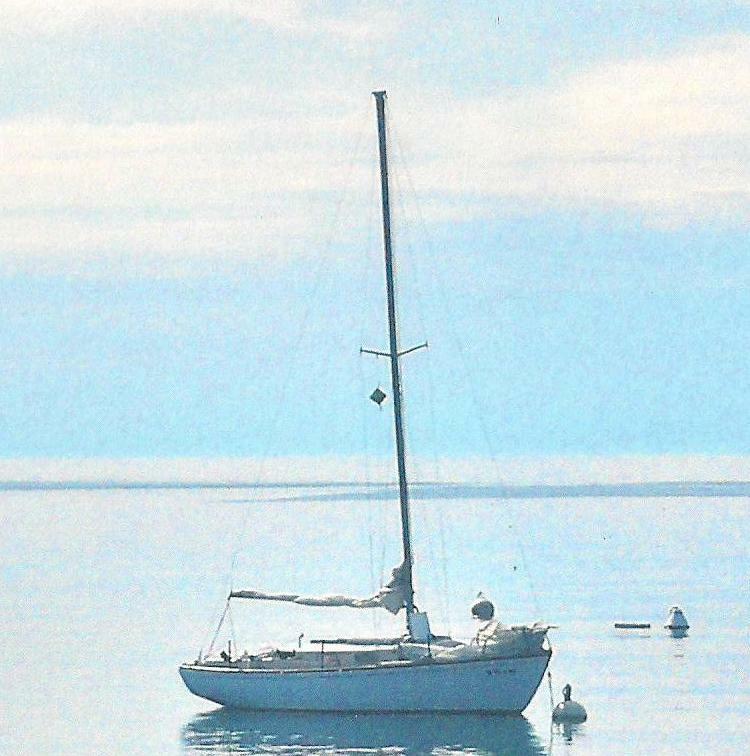 There is now a Dolphin moored in Linconville. 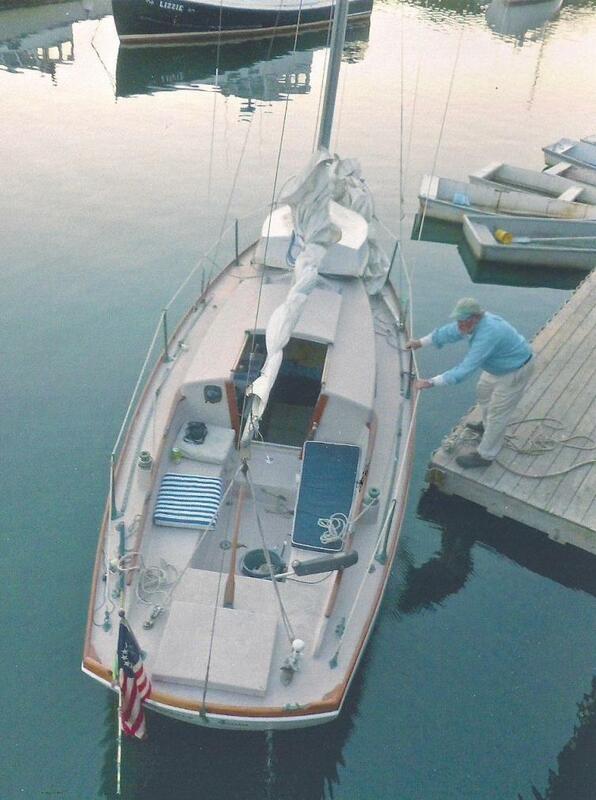 Name on transom is “Paper Moon”. 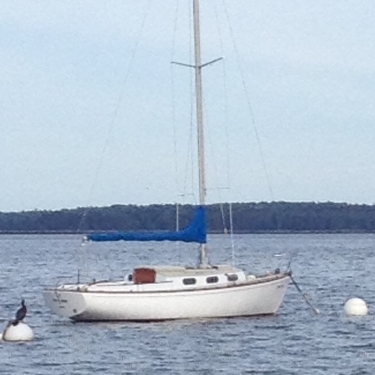 She is in Lincolnville by the ferry pen. I have only seen her through binoculars, but it would appear she is a Yankee, perhaps an early transition to all fiberglass. 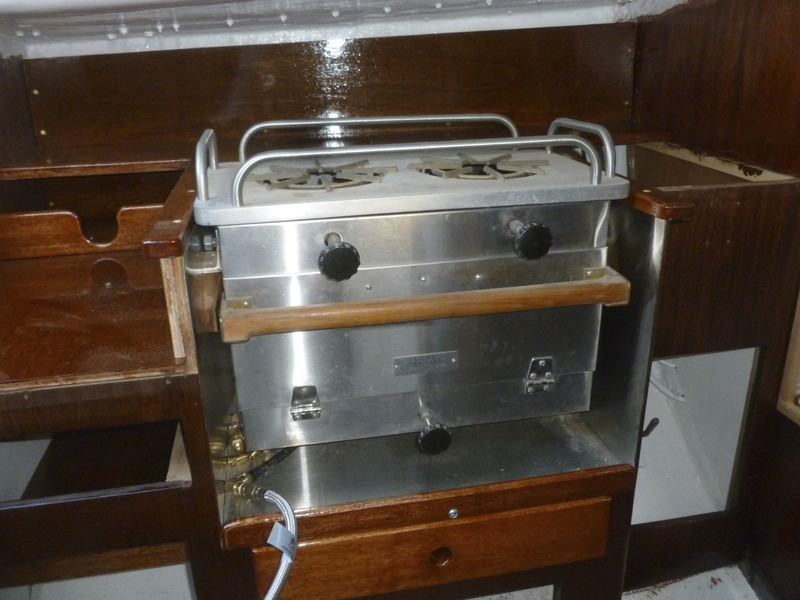 The cockpit coaming is white and shows a configuration similar to my teak coaming with winch pads in the same place and orientation. 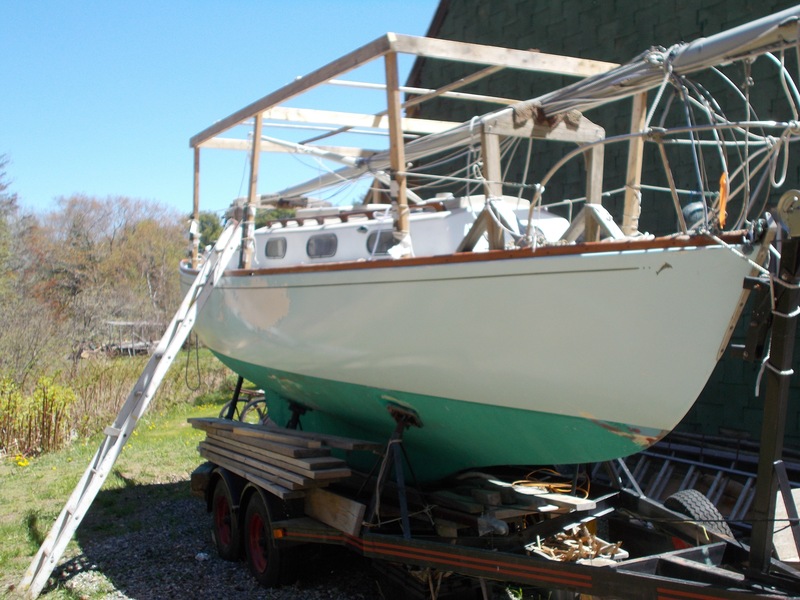 It does appear that there is wood trim on top of the coaming, similar to the treatment on my wood coaming. I rarely carry a camera with me, but may be able to get a photo sometime. September 7, 2014. On September 5, Marionette was hauled in Rockland and this provided an opportunity to 1) deliver to Fred his beautiful scale model of #41 that I had protected on the shelf over my roll top desk these past few years, and 2) meet Admiral Kristie, his long time crew on Paper Moon. 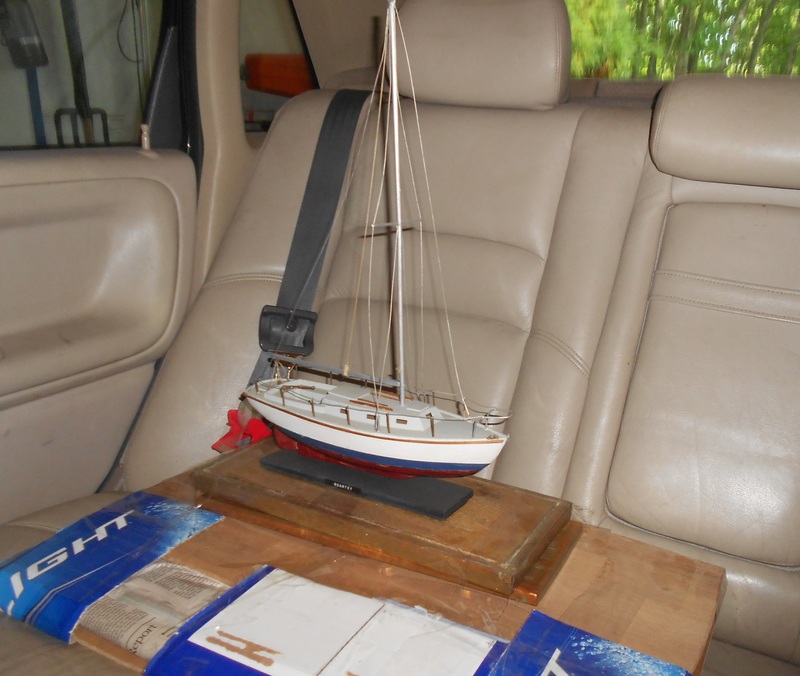 Lincolnville is only a 20 minute ride away and as they were coming down for an artist's gallery showing in Rockland that evening, it seemed logical that we meet for a drink, some Dolphin talk, and make the formal transfer of the model. 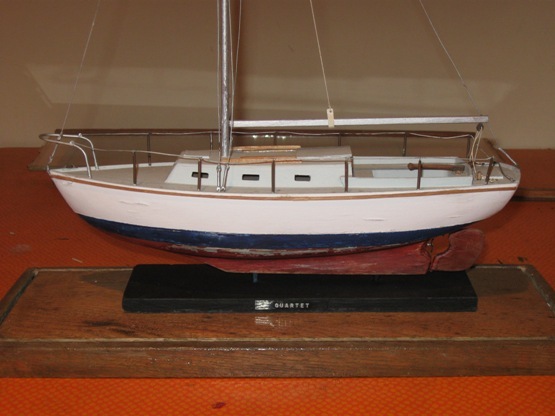 The detailed story of the model is here but the short version is that it was built by, or perhaps for, George Scott, the first owner of #41. Caroline Huber, who with her husband Michael, were the next owners in a partnership with Frances and Jane Ballard (hence the name Quartet). The Hubers had kept the model all these years. Then Caroline heard about Fred and his intercostal voyage on #41, and decided he should have it! 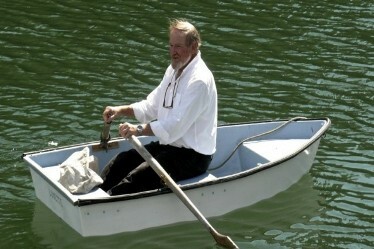 Fred was on the high seas and asked that I hold it for him. We waited for the just right moment to transfer it over to him - and this was the right moment. 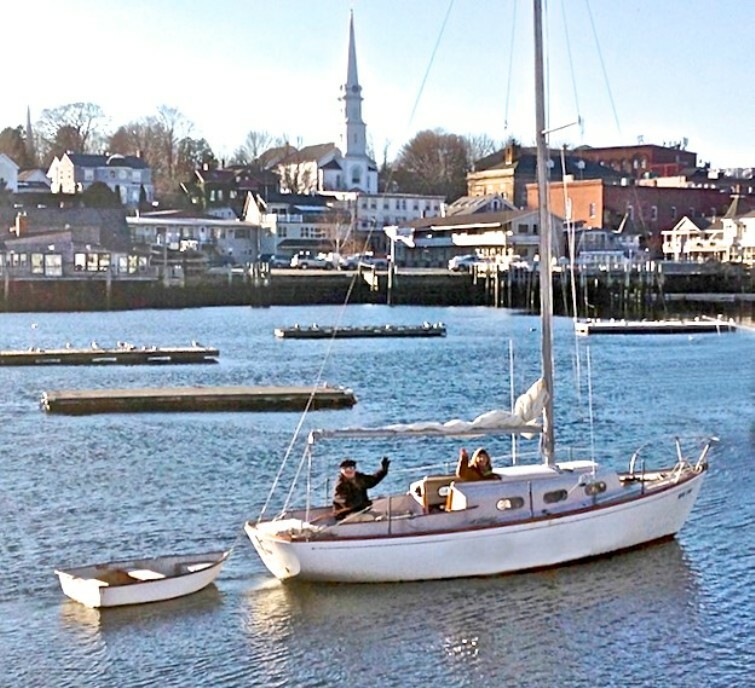 Fred and Kristie had just returned from a short cruise on Paper Moon to Stonington on Deer Island with a stop at Pulpit Harbor on North Haven. Fred renamed Flipper, Paper Moon, in September, 2013 and implied that Admiral Kristie played a part in this renaming. Together they sailed Paper Moon from Martha's Vineyard up to Maine, and Kristie gave me a couple of pictures of their trip. 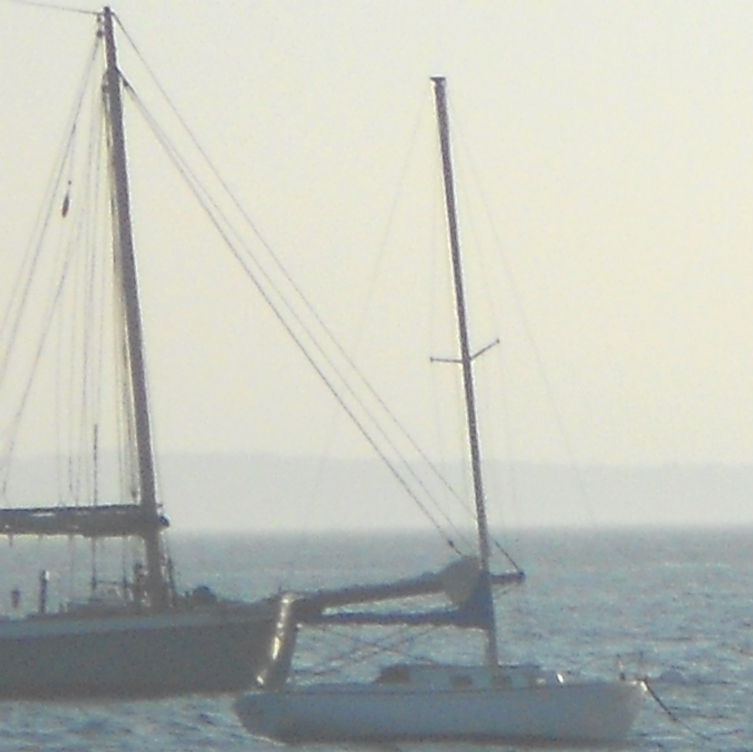 Your webmaster got this shot of Paper Moon on her mooring at Lincolnville - taken from the lobster pier early yesterday morning. 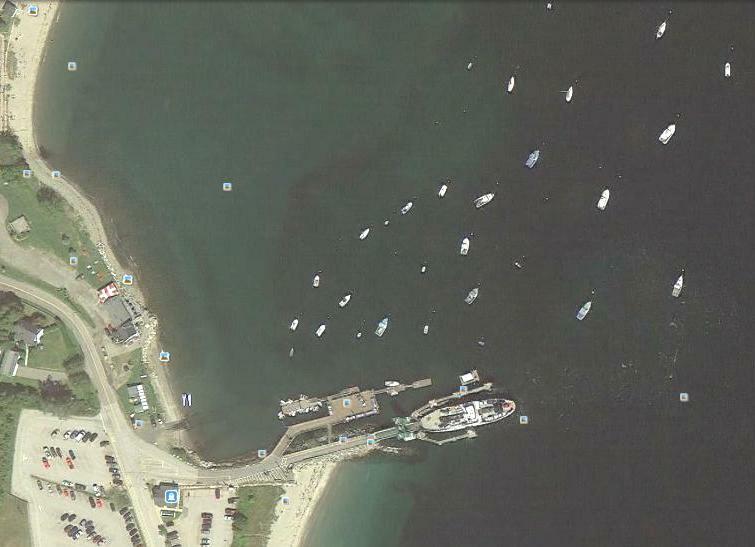 That's Isleboro in the far background, home of Mike Horn's Avellar, Yankee #73. 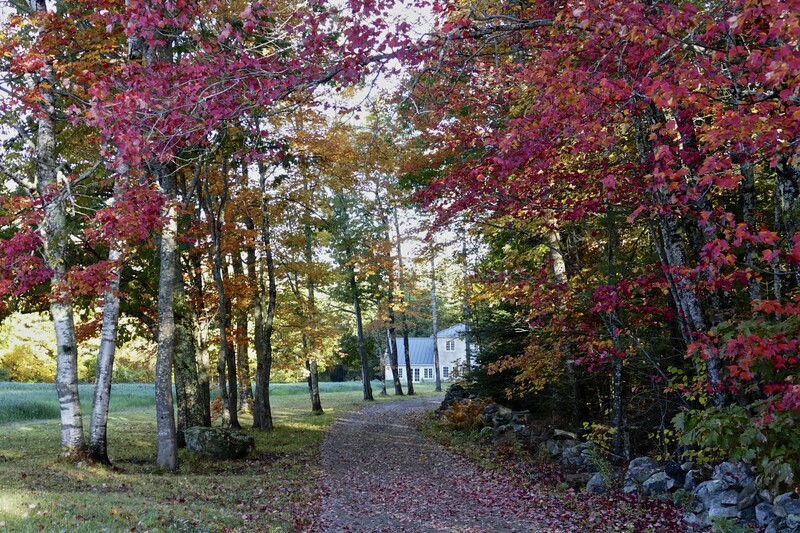 We are down on the Vineyard for a short week and Kristie will zip some Paper Moon update photos early next week. The galley upgrade is pretty radical and I painted the cabin ,cockpit, and house. All the original pink gel-coat is gone. Nice seeing you but I should have paid the tab at Fog. You were too fast and insistent. Next time. I will re-imburse you for the glass, however!!! My wife and I took a couple pictures of "Paper Moon" while passing through Lincolnville last weekend. Tried to get a pic with the "super moon" rising behind Paper Moon but that one didn't come out too well. Here's the best picture we took of Paper Moon. Tried to get that cormorant to take Deb's phone out for a closer shot but we were afraid he'd fly off with it. Happy New Year! 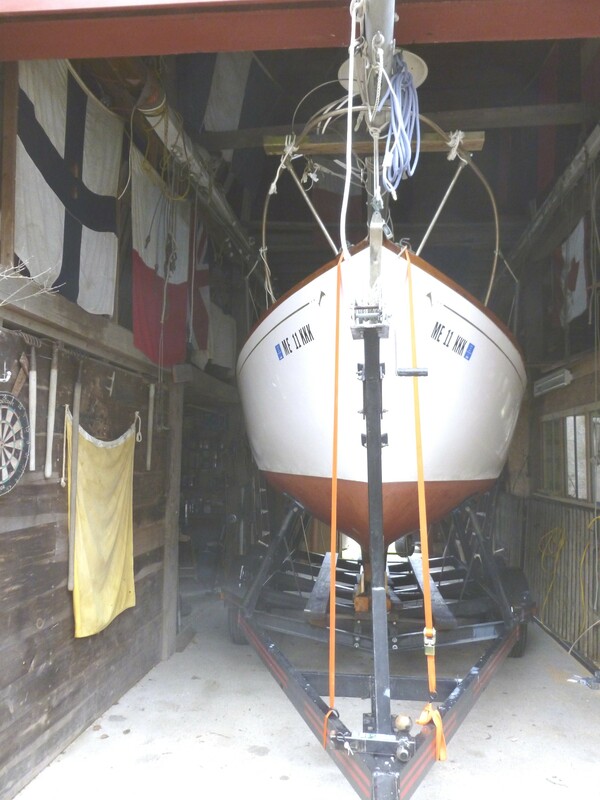 Paper Moon's out beside the barn all covered up and properly winterized on her trailer ready to launch at a moments notice. 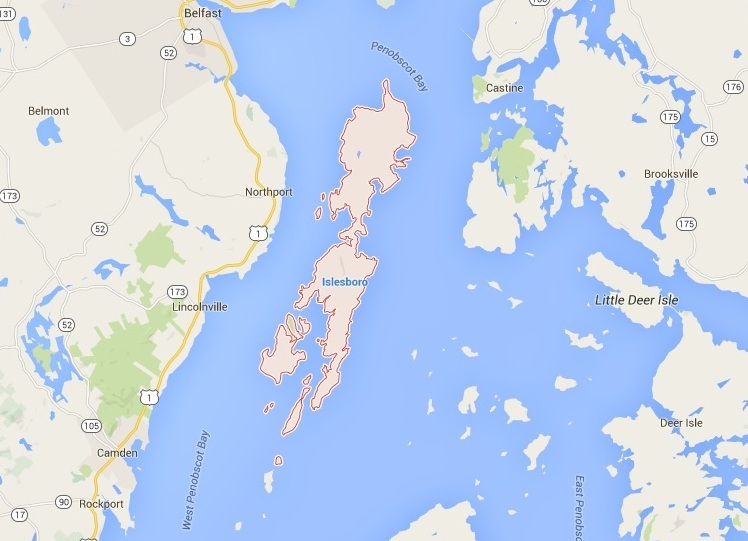 I came in third in the singlehanded division of the round Isleboro race last September! 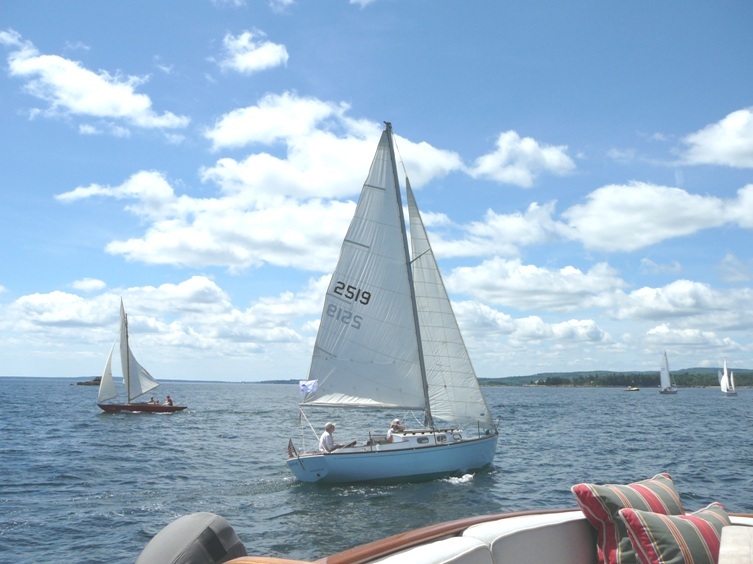 The Around Isleboro Race is hosted annually by Northport Yacht Club on Penobscot Bay in Maine. 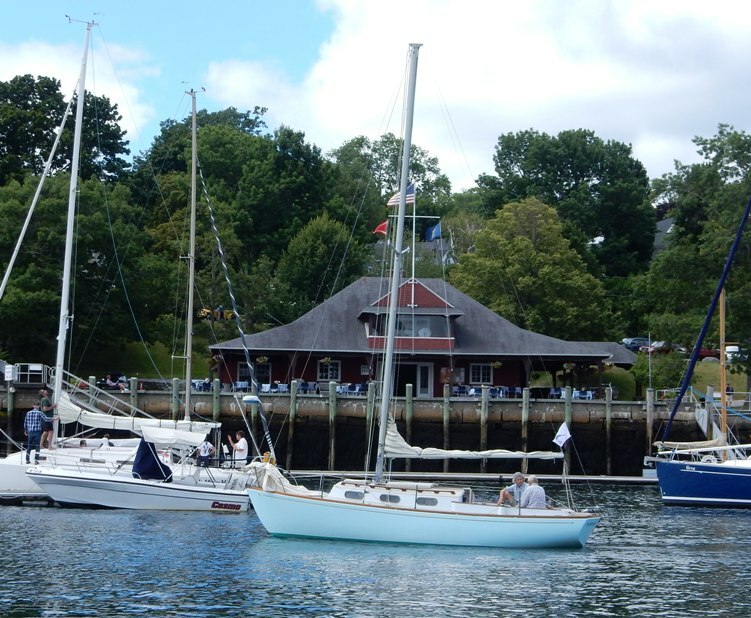 It's a great, small community event whose proceeds partially fund the youth sailing program at the club. 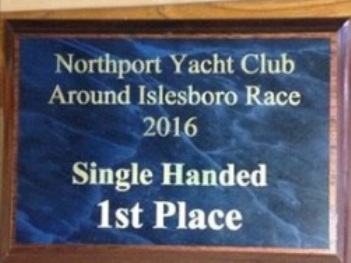 September 12, 2016 - We got a Facebook message from Fred - he won the 2016 Single Handed Around Isleboro Race! We are awaiting details. 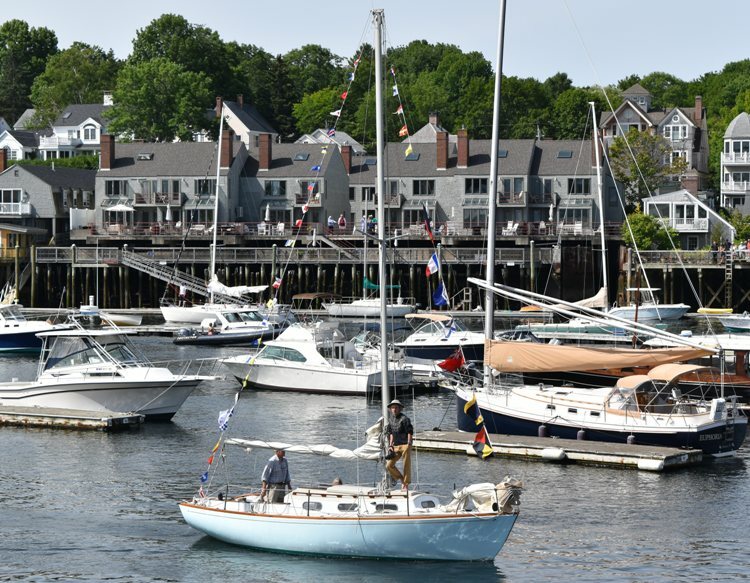 June 30, 2017 We've had a few short Facebook messages and photos from Fred as he gets Paper Moon launched and ready to race in the Camden Classic Cup/Dolphin 24 New England Championships on July 27-29. At this date we have 5 Dolphin 24' entered. Here's some photos of Paper Moon. 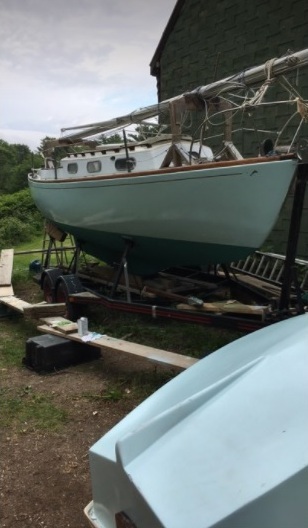 New paint job - Blue Ice over green!